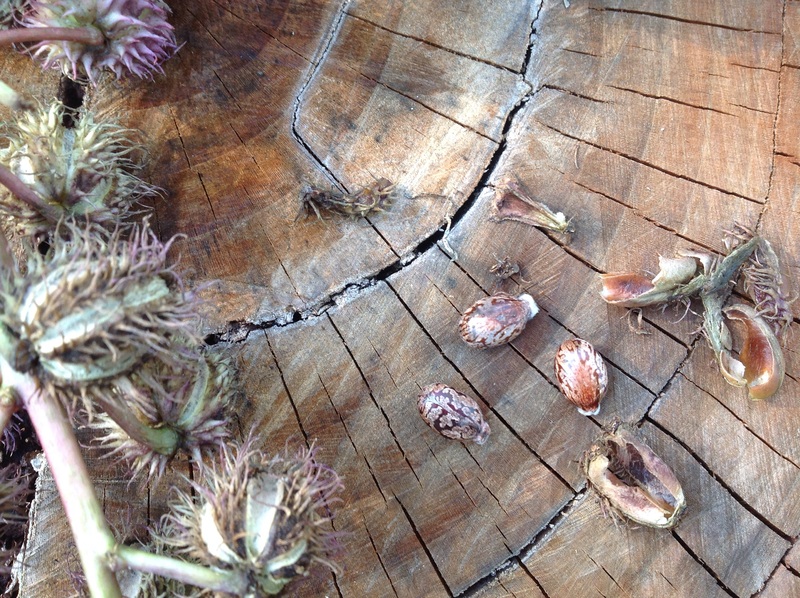 Castor Beans have long been grown as annual ornamental plants. 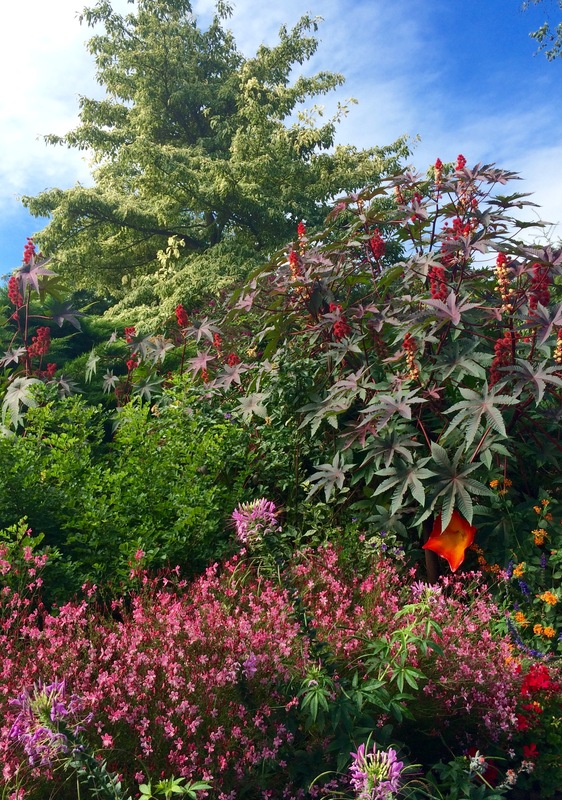 The plants grow to towering heights in the late summer garden with spectacular dark green/burgundy 7-pointed leaves and clusters of bright coral-red seed pods. From a distance the seed pod clusters appear to be exotic flowers. But on closer inspection, they are the plant’s spikey seed heads. Aren’t they cool? The castor bean plant was made famous most recently during the popular Breaking Bad TV series starring chemistry-teacher-turned-meth-dealer Walter White. Why, do you ask? 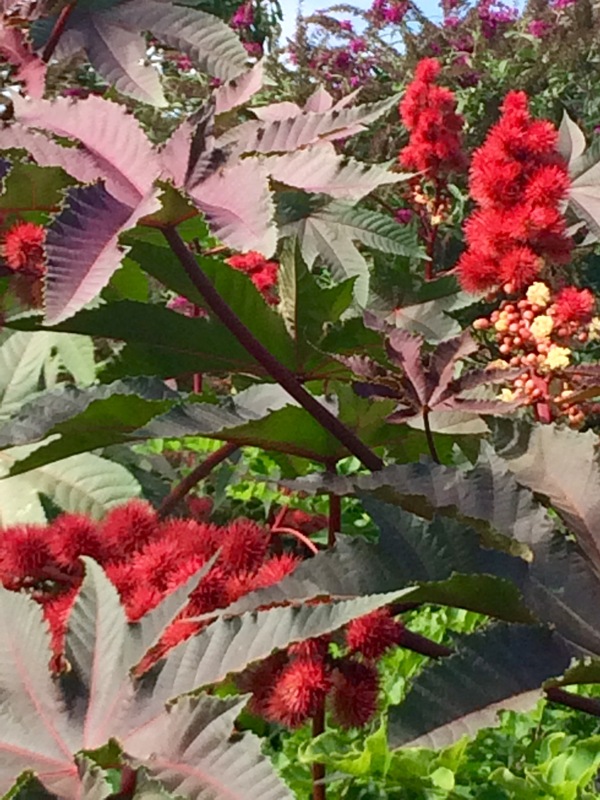 Well the castor bean plant is known by its latin name, Ricinus communis. The water soluble, highly toxic poison “ricin” is naturally derived from the plant’s seeds. A dose of purified ricin the size of a few grains of table salt is enough to kill an adult human, hence why it made an appearance on Breaking Bad. Ricin is also the mysterious powdery white substance often mailed to enemies by vindictive evil persons. But I digress from the plant’s good features. The castor bean is also known as the castor oil plant and is a member of the spurge family, Euphorbiaceae. Its seed is the castor bean which, despite its name and appearance, is not a true bean. 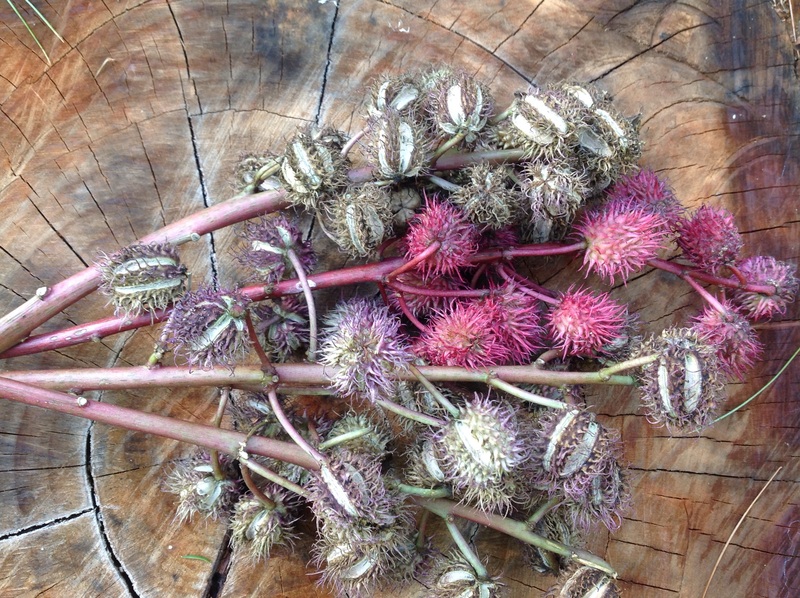 The castor bean is composed of 40-60% oil and is the source of common castor oil. The large oval bean-like seeds are highly poisonous and bear characteristic brownish mottling. Accidentally swallowing a seed is not likely to harm you as the toxin is not concentrated nor purified and will be deactivated by stomach acid. At the end of the growing season, the seed pods will begin to dry and lose their red coloration. The capsule will turn greenish-grey, acquire vertical stripes as it swells and prepares to split open into 3 sections, ejecting its seeds. The always evolving changes in the seed pods enhance the plant’s appeal in the fall garden. You can let the plant self-seed directly in your garden. Or the seeds can be harvested at this stage and stored in a dry, dark place over the winter and planted directly in the soil in spring, after the danger of frost has past. The plant thrives best in full sun locations. Who knew such gorgeous seeds could be so dangerous? As long as the seed is not ingested, you can enjoy all the beauty of this fascinating plant in your garden without worry. It also makes for an intriguing discussion as it is a plant that will attract notice from its sheer imposing stature and fascinating seed pods. Then you can show off your dark side and bring Walt into the conversation! Are you Breaking Bad in your garden? 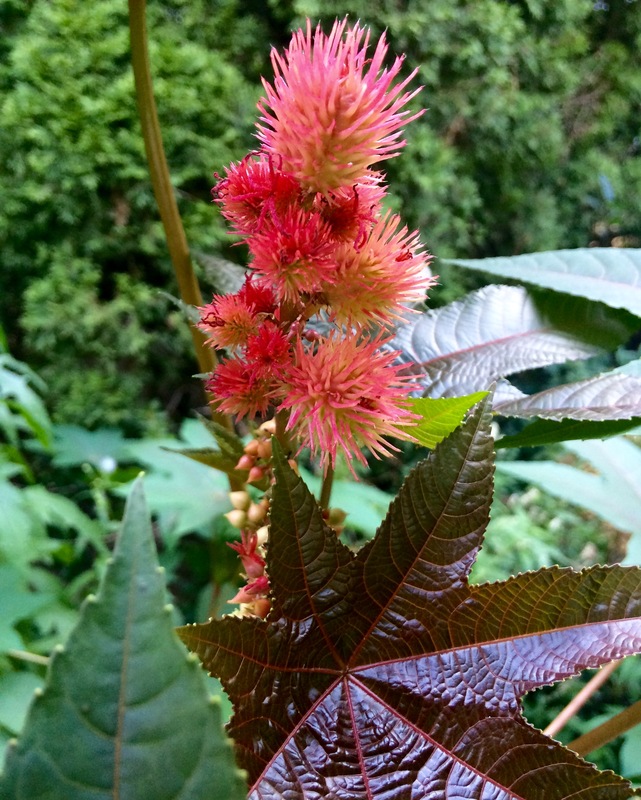 This entry was posted in Gardening and tagged Breaking Bad, castor bean seeds, castorbeans, Gardening, growing castor beans, harvesting castorbean seeds, ornamental castor bean, ricin, ricinus, ricinus communis, Walter White by Johanne Lamarche. Bookmark the permalink. My mother used to coffee at a friends house that always grew caster beans and even then I knew not to eat them. They could have made the rocky mountain horror show! 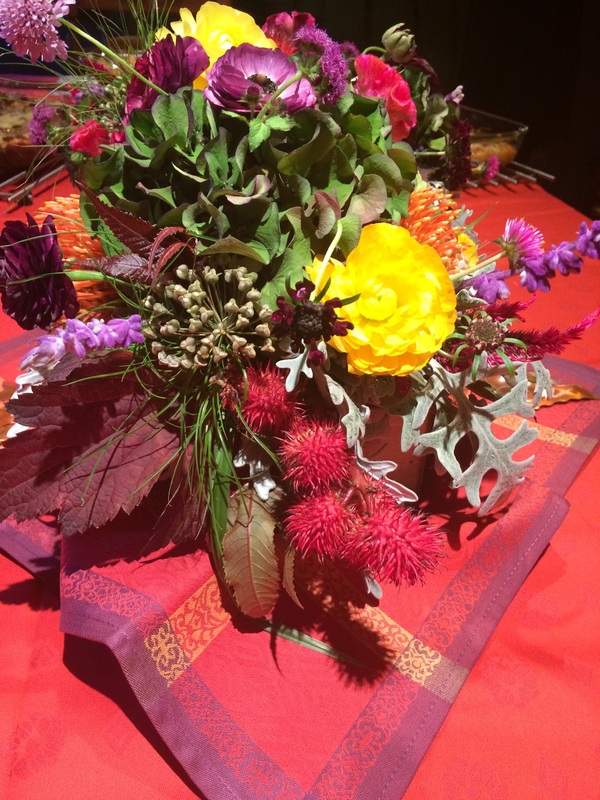 I love the large leaves and colorful seed heads. I just discovered them last year. They are very Jack-in-the-Beanstalk like when you grow them! Good thing you were cautioned on their poisonous nature: they do look like they’d be great cooked with some of your great Mexican spices! Don’t think I’ve seen this plant. Interesting. Know you love Breaking Bad. How gorgeous! What a stunning garden display, plus all your interesting info. 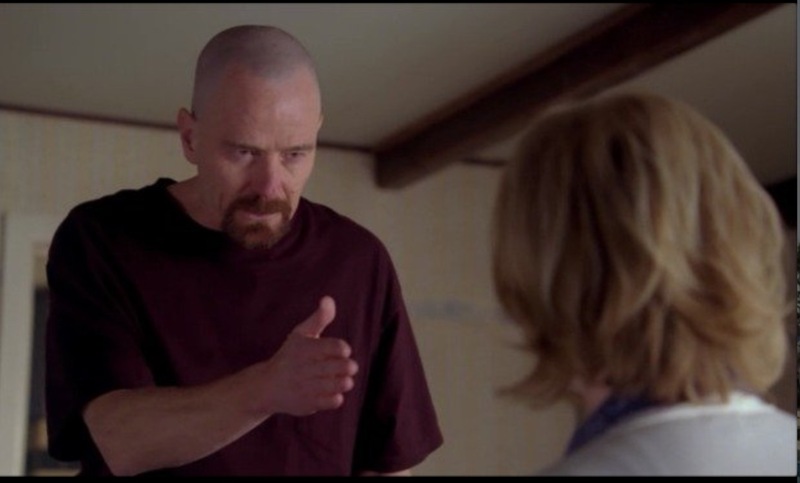 My BIL was just telling me to watch Breaking Bad, I will check it out, thanks Johanne! Thanks Jenna. I’ve been holding on to those seed head photos for a year hoping my plants would come up so I could photograph them. And they did! If you stream BB, do it in small doses. Not for the faint of heart. My whole family were fans and I finally jumped on the band wagon Brilliant writing and acting. The prequel Better Call Saul came out after and is also excellent. So funny! I’m breaking bad in my garden as I had nightshade all over when I came back – so odd. So hard to get rid of! I should have called Saul!I didn’t know about Castor – I’d only heard the name. You should have called Saul! LOL! LOVED that show. I had a hard time finding castor beans in the past. Hope the self seeders don’t become invasive like your nightshade! My gardens is looking very neglected with not living at home. I empathize with you now Mollie! 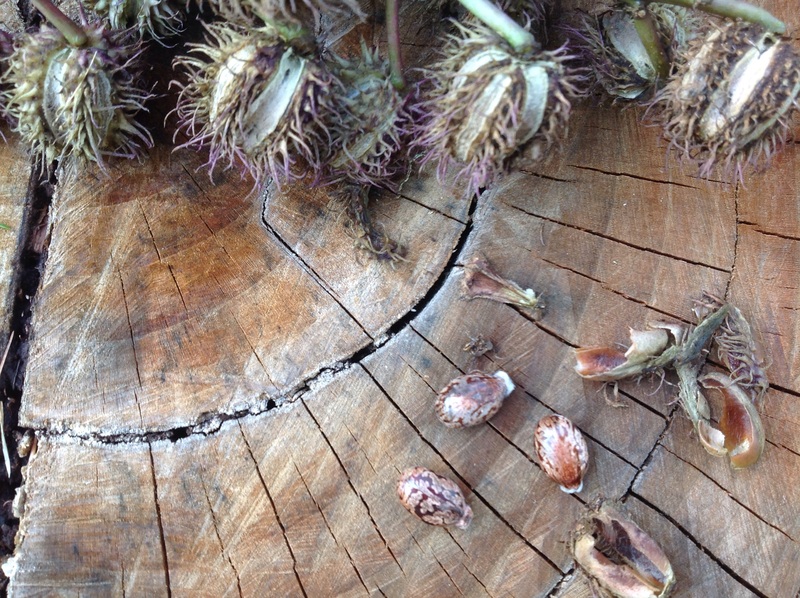 I bought castor bean seeds but none sprouted! So odd, right? The seeds are so big you’d think they’d be very easy to grow. Oh well…now that I know they’re poisonous and we just adopted a dog, I guess it’s for the better. They’re beautiful plants, though, very striking! I just threw mine over a wall and thought they hadn’t sprouted. Then last week, just like in a Jack-in-the-beanstalk fairy tale, they emerged, towering above the wall like magic. I’d be happy to share some seeds if you want some. they’ll be too high for your puppy to get at and when the pods are just ready to open, you can cut them down before they spill their seeds. They are a fun plant.